Why play a Soulthirst build? Because, with 40 uninterrupted seconds of Soul Eater, the build is fast. I believe it's the fastest melee build in the game, and is competitive with the top ranged builds for sheer speed. The build can go as fast as your reflexes can keep up. I will say up front that the playstyle is not for everyone, but if you really want to go fast, and you really want to play melee, this is the build for you. There aren't other reasons to play Soulthirst. It's low dps and squishy, at least the way I've built it, so it's bad at everything besides farming specific maps extremely quickly. The build is based around this belt. It gives Soul Eater on command, a buff which causes each kill to increase your attack and cast speed by 5% each. Since the build takes about 200% increased attack speed with zero Soul Eater stacks, that means that after killing only 60 enemies you double your attack speed, and it only scales up from there. Attack speed scales not only your dps, but also your mobility with Leap Slam. By the time you hit 6+ Leaps per second, your primary adversary becomes the terrain, and monsters are on screen and in range before you can react to them. We use Shackles of the Wretched to curse ourselves with Temporal Chains, extending the flask buff even longer. We boost the effect of Temp Chains in ways I'll cover later on, but ultimately, once the build is completely assembled, we get over 40 seconds of continuous, guaranteed Soul Eater whenever we want it. We get around the actual slowing effect of self-curse Temp Chains by either using Kaom's Roots or using Juggernaut's Unstoppable node. If we can't be slowed below base speed, Temp Chains' only effect is to lenghen the duration of buffs and debuffs on us. Because we use a mana flask to get Soul Eater, we need to do two things: we need to drain our mana constantly, and we need to be able to cast regardless of our mana pool. Soul Taker is the most straightforward way to satisfy both of these conditions at the same time. One Fevered Mind jewel is necessary so that we deplete our mana with Leap Slam even when we don't have many souls. The last required piece of gear is a helm with the "30% increased Effect of Temporal Chains" enchant. This enchant gives almost an extra 10 seconds of Soul Eater, so it is very important. The helm slot is also one of the few places we can get life and resists, so you want to find a good rare if possible. Int is another good suffix. Other than that all the pieces required for Soulthirst to work, we're a standard melee RT build. Loreweave is the BiS chest. The Shaper offhand with "explode enemies on kill" is very convenient for dealing with crabs, porcupines, etc. Goldwyrm because IIQ is always nice. And then jewels and jewelry for damage, life, resists, and attributes. The "%chance to gain Unholy Might on melee kill" on an abyss jewel is very worthwhile, it's up nearly all the time because of the self-temp chains prolonging the duration. Some chaos res would go a long way toward making you tankier, but I didn't happen to pick any up. Ventor's Gamble is another option. Although you don't want to use any flasks while Soul Eater is active, sometimes you'll be facing a single target with no mobs around, and then you can use your other flasks to help with that. These flasks are whatever random ones I thought would be good, I haven't changed the setup since level 75 or something since I never use them. The key nodes here are Skittering Runes and Druidic Rite. Both of these increase the length of Soul Eater, so they are must-takes. The tree is otherwise just a generic RT melee tree. Jugg is abysmal for damage, but we take what we can get. The Endurance Charges from Jugg are used very well on this build, because with a level one Immortal Call and level one Cast When Damage Taken, it's enough for 5 seconds of Immortal Call. Since that's longer than the cooldown on IC, it means that you have effectively permanent phys immunity, assuming you don't get oneshot. If you use Kaom's Roots instead of Jugg, you can use any of the melee ascendancies like Raider, Champion, or Scion. But I chose Jugg so that my boot slot was open for Goldwyrm. While Soulthirst isn't a slow build in any map, you really want to maximize the speed of this build to make it shine. Therefore, any map with doors, narrow passageways, or excessive doodads is out. Getting stuck on a bridge while your Soulthirst timer is ticking down is pure agony. For example, Haunted Mansion is a nice map, but it has way too many doors, so I would not recommend it for this build. The perfect map for this build is Gorge. It's a predictable one-lane map that is just narrow enough that your Sunder hits the whole thing from the center. You can clear the whole map in one flask duration, that is to say, in under 40 seconds. Other good maps include Excavation, Dunes, Bog, Mausoleum, Infested Valley, Atoll, and the ones I've been running in Incursion Flashback: Shaped Geode and Estuary. Leap into a pack to curse yourself, pop the flask, and go to town. I hold down Leap Slam 100% of the time and just tap my Sunder when I see enemies. Personally I find that binding Leap to the key underneath my middle finger (D, in my case, but I use QWERT for flasks) allows me to keep it held down without exerting any effort at all. Eventually, your leap will be so fast that you don't see enemies in time to react and attack them. That's when you start tapping Sunder frequently just to keep your bearings. Half the time your Sunder will hit mobs, half the time it won't, but at least you'll be able to steer lol. I look at the map overlay more than the actual game. This allows you to see the terrain farther in advance and plan your movements accordingly. Then you just need to react to enemies by tapping Sunder. Predictive network mode is the way to go. Any amount of latency or instability causes Lockstep to screw you up, leaping in direcitons you don't mean and generally not moving as fast as you. Make sure you don't quality your mana flask. There's no reason to, it just makes it harder to empty your mana pool. If your flask is ending early, it's either because you've got some source of mana leech, mana on hit, or mana on kill, OR you're not keeping up temp chains all the time by Leaping onto enemies. Soul Taker is the key piece that allows you to get the Soulthirst build online, before you get Soul Taker you play just like a regular Sunder build. Spec a couple points into mana leech, and pick up attributes and resists on the tree if you need to. Once you get Soul Taker, you'll want to pick up a Saturated Grand Mana Flask, of Staunching if possible, since you won't have Fevered Mind yet. (Fevered Mind used to be really cheap until those darn Indigon builds drove up the price.) Now you can start Soulthirsting, so pick up the belt with a 20% "reduced flask effect duration" roll, or as close to it as possible. A low "increased mana recovery from flasks" roll is also nice. The next item to get is either Fevered Mind or your rare helm with the Temp Chains enchant. Fevered Mind has a pretty volatile price, so if you can snipe a cheap one, do it, but otherwise I would buy your helm first. The rare helm you get will determine your resist/int requirements on the rest of your gear, so choose carefully! Once you get Fevered Mind you can make the switch to the Sanctified Mana Flask Of Staunching, which has a 5 second longer base duration than the Grand flask. The final pieces of the build are the amulet, 6L Loreweave, corrupted Shackles and Soulthirst, rings, jewels, etc. You can no longer "stat-stick", so you'll want to replace the offhand Mace with a high-pdps Axe. Without the "explode enemies on kill" mod from the mace, you don't have corpse removal, so it might be worth looking at Bubonic Trail boots, assuming you're not using Kaom's Roots. 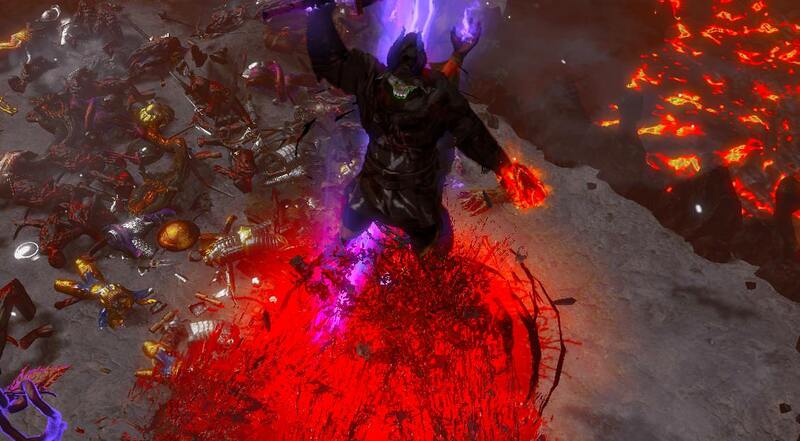 Sunder got its length nerfed, and now Tectonic Slam is the better skill choice. This amulet, Solstice Vigil, is AMAZING for the build. It extends your flask duration from 40 seconds up to 1 full minute. As soon as you can afford it, I recommend getting one. definitely one of the cooler builds i've seen. it's indeed very fast. how's this build as a league starter? I made this one in Incursion Flashback, so I'd say it's okay as a league starter. You're basically a generic Sunder build until you start Soulthirsting so it's easy to work up to it. The two expensive pieces are Soul Taker and Fevered Mind, but if you can get those early, then the build is fairly cheap otherwise. I did up to T11 in a Tabula so you don't have to worry about the Loreweave too early on. Nice build, will maybe try something like it as a league starter for maps/uber lab in Delve. Could you tell me why we take RT and Undeniable? It would make sense either to take RT and Unbreakable/Unrelenting or to take Undeniable and go crit (arguably it would be easier to scale crit for swords using something like reave, soul taker as a statstick). Looks very cool, too intense gameplay for me though. Champion that which you love. He who fights for nothing, dies for nothing. You don't have to take RT, Undeniable is enough. But I like the 100% accuracy more than the slightly higher dps you get from being able to crit. Also means you don't have to worry about enfeeble, blind etc lowering your accuracy. I did a crit version with swords in vanilla Incursion (very hard to scale crit without a Diamond flask nor Assassin's Mark though), so you can definitely do a non-RT version.